The Tower Hill Botanical Garden in Boylston, MA hosted the 2nd annual Dahlia Show this past weekend. Hundreds of blooms in all shapes, colors and sizes from seven different states were submitted to exhibit at the show. This was also the North Atlantic Dahlia Conference regional show. Now, if you live in Mass and have never been to Tower Hill, I encourage you to drive however far away it is and check it out. It is SO so worth it. There are pleasant walking paths, conservatories housing a variety of interesting houseplants and tons of places to sit and enjoy the beauty around you. I went with my 11 year old little sister who is starting to show interest in flowers and plants. As we wandered around she kept mentioning how awesome this place was and how she wishes it was closer to home. Take it from my little chicken- Tower Hill is a place not to be missed. Then we walked into this room just bursting with every kind of dahlia you could dream of! They received awards in every classification. Did you know dahlia varieties are classified by color, size and form? There are 15 different colors, 10 different classifications for sizing and 21 forms. Do the math- there are SO many kinds of dahlias! Who knew? Little sister and I walked around the entire visitor center where every hallway and corner had dahlias on display. We were so infatuated by their unique beauty and amazed by all the passionate growers in all of New England harvesting these beauts! - Dahlias are the official flower of Seattle. - Andreas Dahl (after whom the plant is named) regarded it as a vegetable rather than a garden flower, but interest switched from the edible tubers to the blooms when the first varieties with large, double flowers were bred in Belgium in 1815. According to my Language of flowers book: a single dahlia symbolizes good taste. And from the Book of Love they are a symbol of elegance. Dahlias are very popular flowers seen in late summer and fall weddings and I would agree that they are both in good taste and elegant! 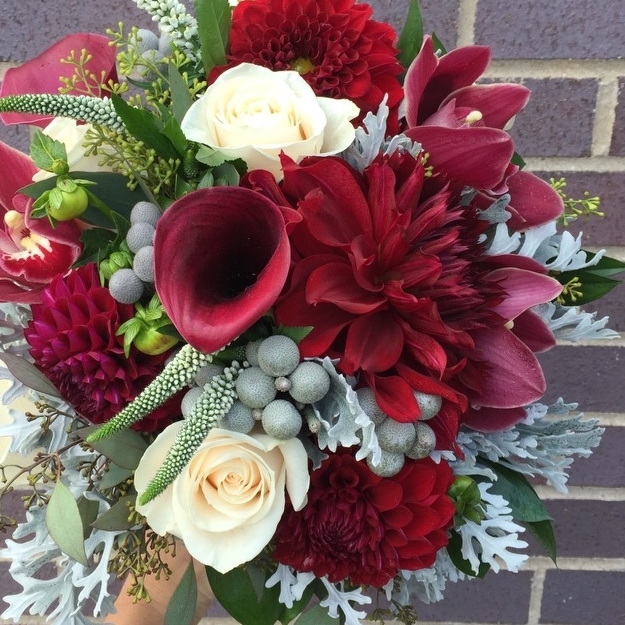 Blush, bright and burgundy blooms below, designed by yours truly. Flower Friday? Feature Friday? Whatever these posts can be called, its FRI-YAY! It is going to cool down significantly here in Boston with a little bit of rain. Are you going on any fun fall adventures this weekend? We are here booking 2018 weddings like crazy! In between consults and proposals, I plan on cooking up some hearty chili and packing away my summer dresses. Have a fabulous weekend! Thank you for reading! Live your life!